In addition to promoting the railways themselves, staff and volunteers promoted North Wales in general and Snowdonia in particular, handing out publicity material from Blaenau Ffestiniog, Porthmadog, Caernarfon and Attractions of Snowdonia. The railway took two locomotives and two carriages to the show and gave rides to over 15,000 people during the course of the show. There were many entries in a competition offering a holiday in Wales with travel passes on the railways. "We did 114 miles on 600ft of track, says the F&WHR’s Railfest co-ordinator, Paul Martin. “And gave over 15,000 people a ride. We punched well above our weight and had people queuing to get on on many occasions – especially during torrential rain on Sunday when we were offering an extremely popular nine minute site down out of the rain!" Attending the show were Palmerston, dating from 1863 and the oldest steam locomotive currently running in the UK and an armoured World War One Simplex tractor, along with FR Carriage 15 – the oldest bogie carriage in the UK – and the unique Victorian Curly-Roofed Van. In the main hall, Spooner’s Boat – the only sail-powered rail vehicle in the UK – was on show alongside historic standard gauge locomotives. 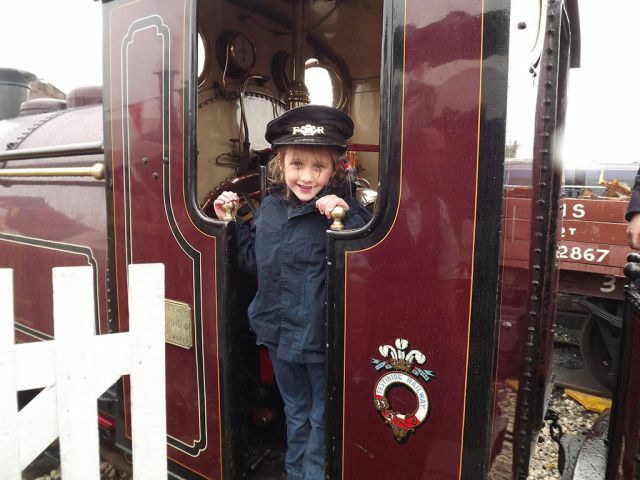 "Undoubtedly the highlight was a footplate (well, tender!) ride on the Ffestiniog Railway's Palmerston! My son and I had a ride and he wasn't at all worried and seemed to relish the opportunity - only problem was he wanted to ride on every loco he saw afterwards! The F&WHR's staff were excellent and very friendly - I certainly hope their attitude will lead to people deciding to visit the railway itself."